1) In a large bowl, combine the water and lime juice. Peel the pears, keeping the stems intact. Cut a small slice from the base of each pear so the fruits sit without toppling. Drop each one into the water; set aside. 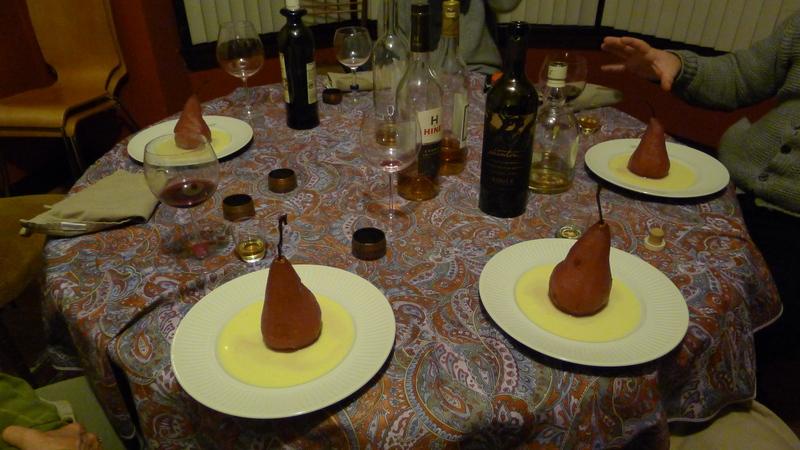 2) In a saucepan large enough to hold all the pears, combine the wine, sugar, anise, vanilla, clove, and cinnamon. Bring to a simmer over medium heat, stirring until the sugar dissolves. 3) Add the pears and additional water to cover the pears. To keep the pears submerged in the poaching liquid, cut a circle of parchment paper the size of the saucepan and set it on the surface of the liquid. Place a small plate on top of the paper so it presses the pears into the liquid. 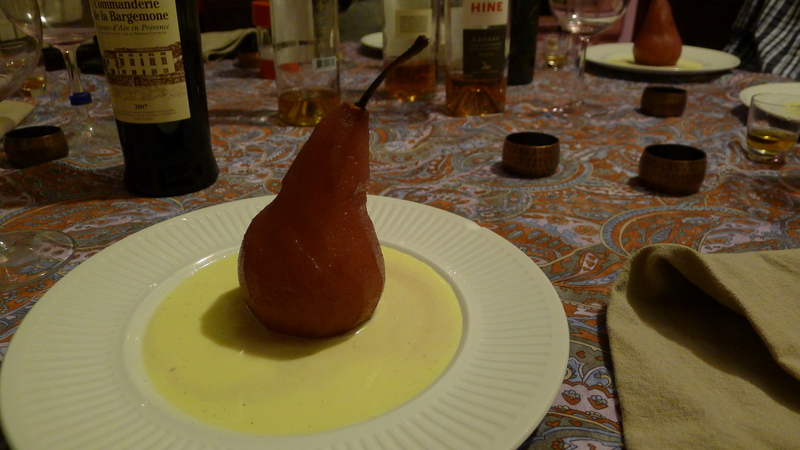 4) Simmer the pears for 25 minutes or until they are tender when pierced with a skewer. They may need 5 to 10 minutes longer if they were not ripe. 5) Remove the saucepan from the heat. Leave the fruit to cool completely in the poaching liquid. 6) Transfer the pears and their liquid to a large container. Refrigerate for at least several hours and as long as 3 days (the longer they steep in the liquid the darker and fuller flavored they will get). 3) Very slowly whisk half & half into egg/sugar mixture so as not to curdle the mixture. 5) Put the creme in a covered container and refrigerate until ready to serve. This was a delicious and light dessert. I hope you enjoy it. We sure did!